Medical Solutions, a travel nurse company, is hosting a scholarship competition awarding three $1000 scholarships to students pursuing a degree in Nursing. The competition begins the first day of Nurses Week, May 6, 2012 and will conclude on June 4, 2012. The scholarship competition, “Nurses of Tomorrow” will begin in conjunction with the start of the company’s Nurses Week celebration, May 6-12, 2012. The competition is intended to provide scholarship support for nursing students with demonstrated financial need and to help develop the world’s next generation of nurse leaders and educators to help combat the growing nursing shortage. 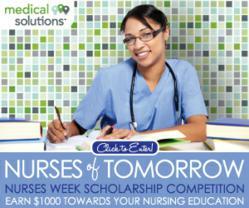 The scholarship competition will kick-off the week long Nurses Week celebration Medical Solutions has planned. Besides the scholarship contest, there will be a host of other contests and giveaways the company has scheduled throughout the week, such as photo and caption contests, trivia quizzes and much more. Be students enrolled full-time, in good academic standing with a GPA of 2.75 or better, or continuing their education at an accredited institution (college, junior or community college, or technical school). Provide a list of community services performed or involved in during the last four years if awarded scholarship. Submit a copy of an acceptance letter from the two year or four year accredited college, university or vocational institution if awarded scholarship. Be a U.S. citizen and student with an Alien Registration number currently enrolled in state-approved schools of nursing or pre-nursing in associate degree, baccalaureate, diploma, generic doctorate, and generic master’s programs. Funds are not available for graduate study unless it is for a first degree in nursing. Medical Solutions, Inc. was one of the first travel nurse and allied healthcare staffing companies to be certified by the Joint Commission and has been continuously certified since 2004. Its focus is on meeting the urgent and short-term staffing needs of its clients with highly skilled Allied Health professionals, Nurses and Technologists. A nationwide network of travelers allows Medical Solutions to help its client hospitals continue to provide excellent patient care amidst a Nursing and Allied Health shortage. Medical Solutions has contracts with nearly 1200 client hospitals nationwide and is one of the fastest growing companies in the travel nursing and allied health industry. Visit MedicalSolutions.com to learn more.